Maybe he’s hiding them… or maybe he knows something about vegetable organisation that we’re not in on yet. Either way, this photo has made our day. If you have ever spent time with someone who’s under the age of five, you will know that their idea of ‘hiding’ and our idea of ‘hiding’ are two different things. Young Patimosi Olive (Osi) is adorable proof of that. Our story begins when Osi was helping his dad make dinner a couple of weeks ago. 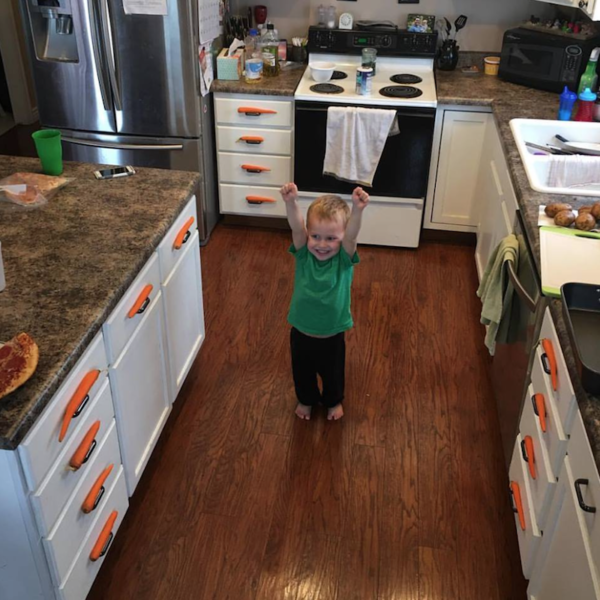 As the 3-year-old’s dad Samson Olive peeled carrots for dinner, one-by-one, they magically disappeared. Gasp! “We were preparing dinner and peeling the carrots,’ Samson explained. All was going according to plan, until mysterious forces began spiriting the carrots away. “We had started to notice that the carrots were disappearing when we started working on other parts of the meal,” Samson said. That must have been very, very eerie, right? It’s okay though, because they found the carrots using the ingenious technique of turning around and looking for them. “We turned around and found the missing carrots as new ornaments on our drawer handles in our kitchen,” Samson told MetroUK. Okay, so maybe Osi wasn’t hiding the carrots after all. He just had some fresh ideas about cabinet embellishment and was not afraid to experiment a little. That seems legit. Osi’s dad says this is pretty typical of his little guy. Samson snapped a shot of the triumphant carrot bestow-er and shared it on social media. His cousin then shared it and the image quickly went viral. Everyone was delighted about the carrots, really. Osi is most certainly prepared for any number of reindeer this Christmas, that is for sure!